I come home from work midweek and change into my outdoor clothes, still shorts and a ratty old t-shirt. The summer heat lingers, even as the days grow shorter. Storm clouds gather as I head outside for my usual “compost hour” of unwinding and reconnecting with the yard that is my small patch of outside world after a day spent inside in front of a computer terminal. It’s still a surprise to see my pile now reduced to a remnant of its once-overstuffed self. I’m an empty-nester, at least for the next few weeks. 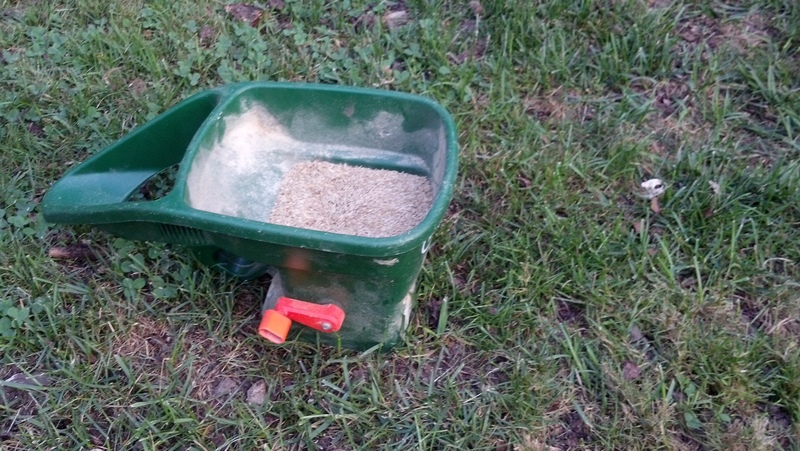 Still, there are other backyard tasks to tackle, like spreading a 10-pound bag of seed across the barest patches of my lawn. I use a small hand-crank spreader, which flings the tiny seeds outward like sprinkles of rain. I grab a few handfuls to cast extra helpings of seed directly on the thinnest spots, avoiding the thickest patches of clover. Aside from tending my small plot of vegetables and herbs, it’s the closest I get to feel like a farmer. I speculate on just how many new seeds I’m introducing to my yard; it must be in the hundreds of thousands. I finish in the gloaming by roughly raking over swaths of the yard to scratch in the seeds with the compost covering the ground, scooting aside the sycamore leaves that are already beginning to dapple the ground. The lawn has received the lion’s share of compost this year, and I am eager for the old grass to revive and this new crop of seeds to find purchase. At best, only a fraction of all these seeds will thrive, but I take some comfort in knowing that I’m adding to the diversity of the turfgrass that grows in my yard. I overseed each year, always buying perennial mixes, all kinds of rye, fescue and bluegrass, usually grown in Oregon. The tiny oblong seeds are indistinguishable to me, but the label lists such evocative names as Evening Shade, Brooklawn, Sierra and Frontier. There are 10,000 grass species in the world, and countless more slight variations from genetic tinkering. I like the fact that my small backyard has more than its fair share of such truly global transplants. I crank out thousands upon thousands grass seeds to cast about the lawn. Waiting for the rain to arrive and break a long, hot, dry spell, I’ve spent the past several days wandering across the yard, picking out a surprising number of sticks, stones and shells that have cropped up as the compost bakes in the sun and crumbles into the turf. It’s like beachcombing, only in reverse. Using wood chips as a mulch for many of the garden beds and pathways, I’m not surprised that my pile harbors so many flecks of wood. The more surprising finds — the shells, the odd horseshoe crab tail or seagull quill, pieces of plastic, especially — are from the washed-up seaweed I heap upon my pile each fall and spring. The largest shells I toss into the vegetable garden to bolster next year’s tomatoes; I pitch the slivers and chunks of wood chips into the perennial garden beds. Although I worry about the mower spitting out a shard of wood or seashell into an ankle or worse, I rather like the fact that the yard is a repository for such odds and ends, originating from so many places other than my own property. At night, the thunderstorms bring an overdue soaking, and set the new seed on its way to germinating as the lawn greens up through the fall. The overnight rains release me from the need to water, at least for a day or two, and I spend the next evenings preparing my pile for the coming season. 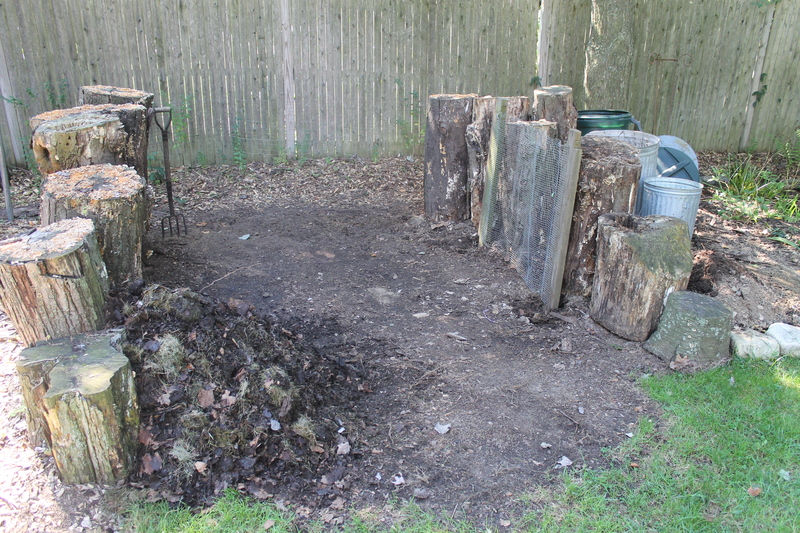 My pile is now a dirt floor between two sets of upright logs, the right side still akimbo. 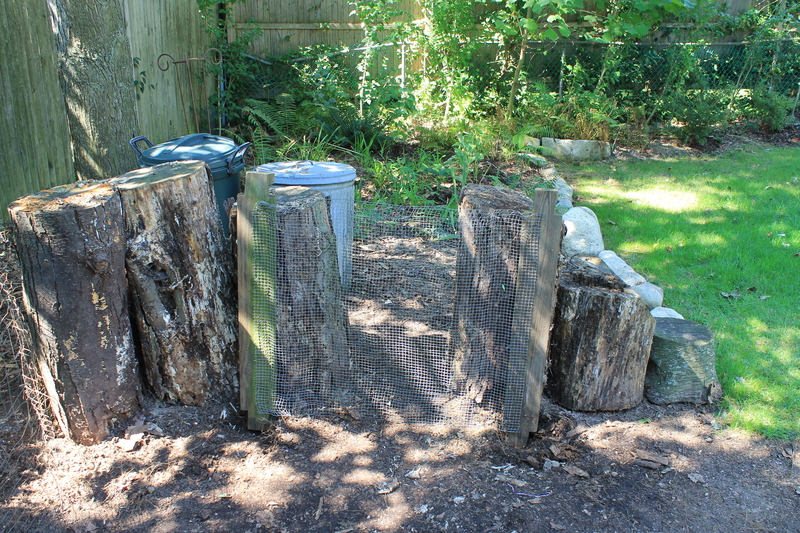 I’d wrested several logs out of place to gain ready access to my pile, and now I need to reset them in place so that they can contain the coming deluge of leaves and seaweed and grass clippings. One log, the skinniest of the lot, is rotted, so I set it on the dolly and trundle it over to my ever-growing refuse pile of tree branches and pulled groundcover. I reset the other logs, using small flat rocks to secure them in place so that I can safely walk across their tops to dump bedsheets full of leaves as my pile grows. The log wall now has a gap, which I bridge with the handmade screen of small-gauge wire netting stapled to two sections of wood gleaned from my son’s long-dismantled play set. I fashioned it some years ago to screen compost but I haven’t used it for several years, finding the process too laborious. Even the roughest gleanings from my pile soon break down into bits and pieces, whether by rake or mower or hard rain. I set the wire contraption on its end on the inside of the two flanking upright logs to create a side door for my pile. As my pile grows this fall, the leaves will press against it. I hope to be able to lift it out of the way when I need to work my pile on through the coming season. It’s a small bit of home improvement that I wish I’d thought of years ago. My pile now has a side door, fashioned by repurposing the wire screen I rarely use to sift compost. Next I take the maddox from the shed and gouge out the surface roots of the two nearby maple trees. Each summer they infiltrate the bottom of my pile, and each fall I do my best to trim them back. I don’t begrudge them their efforts to tap into the rich supply of nutrients that annually swells beneath their canopies, but the network of tangly roots have an annoying habit of snagging the pitchfork I scrape across the ground to tidy up the edges of my pile. It’s a battle I will never win as long as the maples rise up over, and under, my pile, but each year I chop away at the invading roots to keep them at bay. The renovations complete, my pile is now an empty vessel, ready to receive its annual bounty of a season’s growth. Like a chef planning a harvest menu, I begin to plot out the courses that I will soon heap upon it. There are two garbage cans brimming with a month’s worth of compostibles, the tangle of spent vines and stalks from the vegetable garden, and seaweed waiting to be gleaned from the nearby shoreline. But first, the leaves must fall. For now I can only watch and wait. My pile awaits its annual resupply.